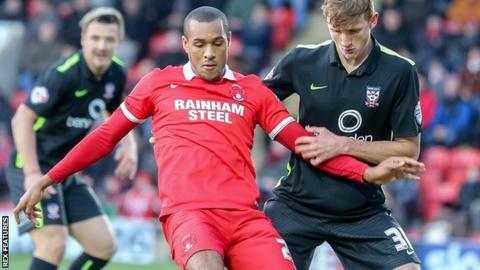 Jay Simpson scored twice as Leyton Orient earned a narrow win over York. The victory comes after the O's squad were made to spend all week in a hotel by owner Francesco Becchetti after the 3-1 defeat by Hartlepool last week. Mathieu Baudry headed in and Simpson scored before the Minstermen pulled one back when Bryn Morris deflected Vadaine Oliver's effort in. "I wouldn't say vital, but it's another victory and it's another three points towards the total. "I think we created more than them, they had a couple of chances towards the end but on the whole yet again we've controlled the game and could have come out much bigger victors. "We've got a back four there that have not played together, we've got two new centre halves in the side, there's going to be a little bit of time before they get settled." "I thought they were the better side for the first 20 minutes. They started brightly with a good effort early on. "I thought we came in to the game but I was disappointed again with the early goals that we lost. "We got a lifeline going into half-time and I thought there was a real opportunity in the second half to go on and win the match - and we lose another goal. "We had some good opportunities to score goals today and I'm very angry with the goals we lost." Match ends, Leyton Orient 3, York City 2. Second Half ends, Leyton Orient 3, York City 2. Attempt saved. Vadaine Oliver (York City) header from the centre of the box is saved in the top centre of the goal. Corner, York City. Conceded by Frazer Shaw. Goal! Leyton Orient 3, York City 2. Vadaine Oliver (York City) header from the centre of the box to the top right corner. Assisted by James Berrett. Corner, York City. Conceded by Sean Clohessy. David Tutonda (York City) wins a free kick on the right wing. Bryn Morris (York City) is shown the yellow card for a bad foul. Foul by Bryn Morris (York City). Substitution, Leyton Orient. Blair Turgott replaces John Marquis. Substitution, Leyton Orient. Jobi McAnuff replaces Bradley Pritchard. Bradley Pritchard (Leyton Orient) wins a free kick on the left wing. Substitution, York City. Anthony Straker replaces Michael Coulson. Corner, Leyton Orient. Conceded by Femi Ilesanmi. Corner, York City. Conceded by Alex Cisak. Attempt saved. Vadaine Oliver (York City) right footed shot from the centre of the box is saved in the bottom right corner. Goal! Leyton Orient 3, York City 1. Jay Simpson (Leyton Orient) right footed shot from the centre of the box to the bottom right corner. Corner, Leyton Orient. Conceded by William Boyle. Substitution, York City. Emile Sinclair replaces Jonathan Greening. Substitution, York City. David Tutonda replaces Ben Godfrey. Attempt missed. Bryn Morris (York City) right footed shot from the right side of the box is just a bit too high following a fast break. Sammy Moore (Leyton Orient) is shown the yellow card for a bad foul. Eddie Nolan (York City) wins a free kick in the attacking half. Jonathan Greening (York City) wins a free kick in the attacking half. Attempt missed. Jay Simpson (Leyton Orient) right footed shot from the centre of the box misses to the left.